Welcome and don't apologise. I agree with you save with the caveat that while Stephens does Aragorn well, I am not to sure about Strider!! But that is a minor quibble. I also thought Vigo did a good job despite not being physically the obvious choice A lot of the film casting was good, the costumes and sets were gorgeous.. it was what they did with them that caused the problems for me. I feel your post deserves a better reply butit will have to be later alas! This has been quite an interesting read while researching some material on Michael Hordern Unfortunately, tolkienradio.com is no longer online and some of the other links have gone, too. I didn't get to actually speak to him as there we too many with the same wish at the British Library hobbit event last year but myvfriend who went to RoTR got his autograph for me which I treasure. Hordern was remarkable. A great Shakespearean and the voice of Gandalf...and Paddington Bear. Welcome to the Downs. My article on Michael Hordern is now online via my page; I won't spam it here (this being my second post only *g*) but if you take an interest in this I'll link to my blog in my profile in a second. Well done for taking the plunge. I would certainly be interested in reading it. Oh wow... there is a recognisable name. Since the article is pertinent to the subject, and you are open about your connection I think it would be fine and indeed useful to link to it here. And I hope you will find other things here that interest you. Enjoy being dead as we say here. The series is available for download via the BBC at a very reasonable price (along with some other Tolkien stuff here http://www.audiogo.com/uk/catalogsea...ult/?q=tolkien £6.99/$10.99. Brian Sibley's Audio Portrait is very good (just wish his other Radio 4 doc, Fired by the Ring was also available. Some of you might also be interested to hear that the soundtrack to the BBC Jackanory adaptation of TH will also be available in October http://www.amazon.co.uk/The-Hobbit-J...ckanory+hobbit so we can listen again even if we can't watch. Fantastic. The Jackanory recording was my introduction to Tolkien and missing the final episode for Brownies meant I bought the book. Actually that isn't a particular loss. I have no visual memory of it save Bernard Cribbens sitting crouched forward, but very strong memory of his voice. I remember the opening credits. They were quite special/celebratory. I think it was a special anniversary - maybe the 100th Jackanory story, or something like that? Mine too, but I think I only saw/heard the Giant Spiders episode. So not significantly "spoilered." Also the narrator of the Watership Down film (which also featured Richard O'Callaghan, as Blackberrry, I think, and I've an idea Michael Graham Cox was Bigwig, too). Michel Hordern was also Baptista in The Taming Of The Shrew (Zeffirelli film). And of course he was Badger in the Cosgrove Hall "The Wind In The Willows" too (both the film and the six TV series) - he's very like Gandalf in that, but a little more rustic in his speech. Welcome to the Downs from me too. Last edited by Pervinca Took; 08-19-2013 at 05:34 AM. It was the 3000th. The opening, and a little bit from the third episode, are in that You Tube clip I linked to in my last post. Thanks for that, davem. 3000th story, or 3000th episode? I think it must have been episode. Even if it ran solidly it would take over fifty years to do 3k stories at one a week. Yes, you're right. A pity they didn't have the foresight to preserve all the episodes in visual form. A few of the other classics have survived, as they were released on video. Perhaps there was still enough anti-Tolkien snobbery at the time for "The Hobbit" not to be viewed by people making such decisions as classic children's literature (although enough positive feeling for it to get an important anniversary slot - different decision-makers, perhaps). Then again, it could be completely random. So many good quality recordings have been wiped. Last edited by Pervinca Took; 08-20-2013 at 06:27 AM. Is it the case rhat the visualschave been lost or is it a coomercial or copyright issue? I think Brian Sibley said something upthread about rights changing., it amy be that it has to be an audio for copyright issue even though it is a dramatic reading rather than a dramatisation. Or it maybe thought that modern children won't watch people reading and a cd to play in the car is a better bet. Anyway, I am so, excited that i will get to hear this again. I'm not aware that the BBC has had this kind of agreement with HC before. Wonder if there was some kind of requirement laid down by the Estate. Certainly the BBC's LotR & TH dramatisations haven't carried HC cover art. RI noticed that but it may just have suited both to tie it in. Especially IF there is some restriction on the Jackanory visuals. I really like what I have seen of the Catlin illustrations as I have said elsethread. She will be at Oxonmoot so maybe someone will be able to ask. Just had a poke around amazon and notice that the BBC radio collection recording of Narnia has Pauline Baynes drawings as cover art and .Winnie the Pooh has EH shepherdmones ao it may rather bev thatv LOTR was exceptional in having original artwork, especially since it was never expected that recordings would be sold to the public. David Wood, one of the Jackanory cast, along with Jan Francis, Maurice Denham & Berhard Cribbins, has just posted a response to the news on his website - apparently no-one had told him, or his agent, about the CD! I posted on his guestbook about the production being made available & this is his response - some interesting bits in here. Just seen on Amazon that the fantastic Jackanory adaptation of The Hobbit you were in is going to be out on CD in October! Wonderful news, but, no DVD? Was the video lost, or is it a copyright thing. The set, & seeing all of you performing added so much to the whole experience. Thanks, David. The news in your message came as a complete surprise! I was pleased to hear that the BBC are releasing our JACKANORY hobbit as a cd – but it would have been nice if they had told me!! Or contacted my agent! Heigh ho! Anyway, thank you for alerting me to the release of the cd! Hope it brings back some memories! We had fun doing it – at the old Lime Grove Studios. We were in a studio next to the GRANDSTAND studio, where Des Lynham was introducing – live – the Saturday afternoon programme. In our lunch break, Bernard Cribbins and I crept in to watch, and were tempted to interrupt the broadcast!! But we were too law-abiding! 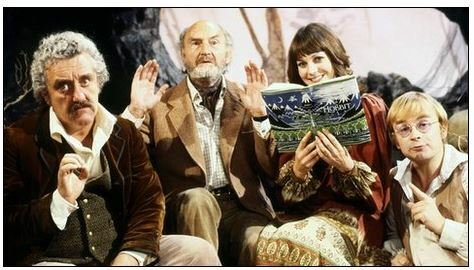 So, looks like the Beeb did want to release the series on video - so I assume that at some point they did have a decent video copy - but it was scuppered by the Estate (Tolkien Gateway refer to it as a "copyright battle" http://tolkiengateway.net/wiki/Jackanory). Be interesting to know why they've changed their minds now? Can't believe Des was doing Grandstand back then! Last edited by davem; 08-25-2013 at 03:28 PM. I wonder if really the estate or Zaentz. So often they are used interchangeably and it was certainly zaentz thatauthorised the musical of Lotr. Or maybe the other versions had some sort of exclusivity right that has now expired. This sort of issue isn't solely Tolkien..imknowntherecwere problems with the Forsyte Saga. According to the audio go website its available from next week, on CD or download for £2.99. Though today I found it available now from Amazon UK. I maay get downwiththekids and learn to download..
My copy of the Hobbit has arrived . Its a double CD, two and a half hours and the audio is perfect. no booklet or pics, just an index card with chapter titles. squee... i am almost scared now. couldn't bear it if the golden memories were just an ilusion. Sadly, though at a very good age, Peter Howell has died. As Saruman in this adaptation his performance was as subtle and skilful as the role demanded. Fellow Brits may also have heard him as the Bishop of Felpersham in "The Archers". May his spirit, unlike his character/s gain admittance in to the West.